It is an annual address given by the President to a joint session of Parliament and marks the official opening of the legislature. It is designed to be a report on the economic and social state of the nation, and includes a review of the past year and priorities for the current year. This is a special and unique occasion where all three arms of the state are in the same place together. In a general election year, two State of the Nation Addresses are delivered. SONA will be delivered on Thursday, 7 February 2019 at 19:00. 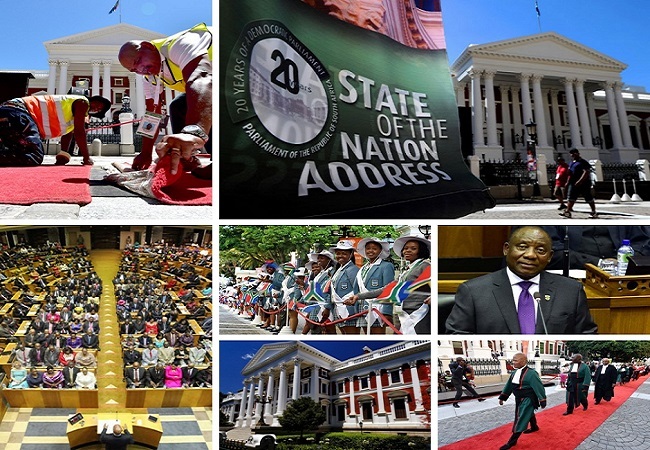 Since 2010, the SONA has been delivered in the evening to give more South Africans an opportunity to listen to the address. The setting is the same as always: the National Assembly Chamber. 3. Theme The theme for this year’s event is: “Following up on our commitments: Making Your Future Work Better”. The speech will seek to build on the governing party’s January 8 Statement. The speech will largely be a report back on the administration’s progress and achievements over the past 5 years. It will also be an opportunity for the President to layout his party’s vision/manifesto to a prime time tv audience: this includes the plan to grow South Africa. The National Assembly gallery can only accommodate 720 people, so the overflow are accommodated in other parts of the parliamentary precinct. The budget for SONA 2019 is set at R2.5 million. This is a big reduction from the previous year where R4.7 million was budgeted an actual expenditure came to R1.9m. The debate on the State of the Nation Address is scheduled for 12 and 13 February and the reply by the President is set for 14 February.